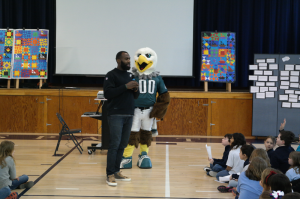 The Lake Forest North Elementary School’s Black History Month celebration was made extra special with a visit by Malcolm Jenkins, Safety for the Philadelphia Eagles, who was the motivational speaker for the program. Jenkins, an advocate for youth and education, was invited in his role as Founder and Chairman of The Malcolm Jenkins Foundation. Philadelphia Eagles Mascot SWOOP joined Jenkins for a very spirited Question and Answer session. Lake Forest North Elementary School, located in Felton, DE, is an award-winning Title I school comprised of grades Kindergarten through Three with a mission to make America great by giving students the knowledge, skills, and attitudes to become successful, responsible citizens in this ever-changing world. The school’s Black History Month Celebration was an entertaining and enlightening melange of songs and portrayals of notable African-Americans. Noting “Black History is American History,” Jenkins encouraged the youngsters to “read and learn as much as you can about the contributions of Blacks and others in history all year.” His remarks also focused on the importance of being a good and well-balanced student; listening to parents and teachers, and caring for others; at home, in school and in their community.